Today, the trailer for the Netflix original series Marvel’s Jessica Jones was revealed at Comic Con Paris with series stars Krysten Ritter (Jessica Jones) and Carrie-Anne Moss (Jeri Hogarth). To view the trailer, click here to visit the show’s Facebook and Twitter. The series will premiere on November 20, 2015 at 12:01am PT in all territories where Netflix is available. To watch the first full trailer for Marvel’s Jessica Jones please click the following link. Marvel’s Jessica Jones is the second of four epic live-action adventure series (Marvel’s Daredevil, which is now streaming, Marvel’s Luke Cage and Marvel’s Iron Fist, all leading up to the teaming of the main characters in Marvel’s The Defenders) to premiere only on Netflix. It is a suspenseful, edgy look into the life of Jessica Jones, one of the most popular new Marvel characters of the last decade, as she faces demons from within and without. The drama will premiere with thirteen (13) one-hour episodes. After a tragic ending to her short-lived Super Hero stint, Jessica Jones is rebuilding her personal life and career as a detective who gets pulled into cases in New York City. 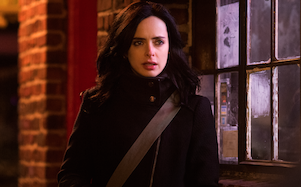 Krysten Ritter (Jessica Jones) is joined by an amazing cast including David Tennant (Kilgrave), Mike Colter (Luke Cage), Rachael Taylor (Trish Walker), Carrie-Anne Moss, Eka Darville, Erin Moriarty, and Wil Traval,among others. Marvel’s Jessica Jones on Netflix is Executive Produced by series Showrunner Melissa Rosenberg (Twilight, Dexter) and Liz Friedman (Elementary), along with Jeph Loeb (Marvel’s Daredevil, Marvel’s Agents of S.H.I.E.L.D. ), who also serves as Marvel’s Head of Television.